2014 marks 50 years since the introduction of GI Joe, America’s Movable Fighting Man and the first action figure. There were fears that Hasbro would either miss this important anniversary entirely, or somehow find a way to screw the pooch. Don’t get me wrong. 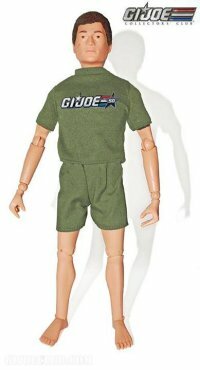 Hasbro’s plans for GI Joe in 2014 are wonderful news for the 3 3/4″ “Real American Hero” incarnation of the classic toy, but for fans of the original GI Joe, the foot-tall everyman with accessories “sold separately,” Hasbro has bupkis. The Official GI Joe Collectors Club is offering a couple of items, one a freebie for joining the club, the other a high-priced convention exclusive, but if anybody is inspired by all the recent media coverage of the anniversary to run to a store to buy some kind of action figure like they grew up with in the 1960s and 1970s, they are SOL (that’s “Soldiers Out of Luck,” by the way). It seems that Toys R Us is the exclusive retail partner for Hasbro to mark GI Joe’s fifty years. Sadly, this is in line with what I’d been told. Retailers were skittish because the most recent GI Joe product, tied to a movie that was delayed almost a year after the toy tie-ins were already in stores, seriously underperformed. Retailers also still remember the GI Joe 40th Anniversary Celebration that was way, way, way too ambitious and crashed and burned at retail. With that line, excellent as it was, collector’s were expected to pay forty dollars each for four different sets in each wave, with a new wave released every couple of months. The line was cut short and later sets were blown out at ten bucks a pop on clearance. 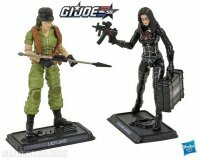 Lady Jaye and The Baroness in a two-pack coming to TRU. This might be the rare one, folks. So it’s no shock that GI Joe’s golden anniversary will be celebrated with more of a whimper than a bang. Still, I can’t help but think that Hasbro is leaving money on the table. If they’d pitched a single 12″ figure with some kind of anniversary package and a reasonable retail price, they could probably have moved a lot of them and made a lot of collectors and retailers happy. Still, they are marking the anniversary in a bigger way than many people expected. We will have full details on the 3 3/4″ product and the GI Joe Kre-o construction sets, which are also exclusive to Toys R us, in a day or so, once Hasbro makes the images widely available. The sample images we have are courtesy of The Official GI Joe Collectors Club, and were posted on their Facebook page. UPDATE: Canadian GI Joe collector Ken Davis had this astute observation on Facebook, “So we are celebrating the 50th anniversary……..of a trademark?” Basically, yes, that’s it. Vehicle sets with figures. Great news for fans of the little GI Joes, but cold consolation for GI Joe’s original fans. “MYEAH, SEE? WHERE’S YOUR VINTAGE GI JOE NOW? SEE? MYEAH!